Bathsheba attends her dying son, while David fasts and prays in repentance. Bathsheba (בת שבע) was a wife of King David and the mother of King Solomon. She was also the former wife of Uriah the Hittite, one of David's famous military captains. Her name, given as "Bathshua" in the Book of Chronicles, means either seventh daughter or daughter of the oath. Her story is found primarily in 2 Samuel 11-12 and 1 Kings 1-2. Bathsheba conceived a son out of wedlock with David after the king spied her bathing on her rooftop, summoned her to his palace, and slept with her. David then compounded his treachery by having her husband, Uriah, murdered after failing to create a credible cover story for his sin. The son of David and Bathsheba's union died soon after he was born, but Bathsheba conceived a second son, who would become the future King Solomon. In David's old age, she became an important figure in the royal politics of succession, helping Solomon to the throne, and later, perhaps unwittingly, providing evidence that Solomon's rival, Adonijiah, planned treason. In Christian tradition, Bathsheba is one of four Old Testament women listed as an ancestor of Jesus. Bathsheba was the daughter of Eliam (2 Samuel 11:3; the syllables are reversed in 1 Chronicles 3:5, where his name is Ammiel). Her father is identified by some scholars with the Eliam mentioned in 2 Samuel 23:34 as being the son of Ahithophel, one of David's counselors. This would explain her being housed near the king's residence in Jerusalem. According to 2 Samuel 11, despite it being spring—"the time when kings go out to war"—David stayed in Jerusalem while his army, under Joab, battled the Ammonites at Rabbah. As David walks on the roof of his palace late in the afternoon, he spies Bathsheba bathing on a rooftop below. He immediately desires her. Although she is the wife of his heroic military captain, Uriah the Hittite, David calls her to the palace and commits adultery with her. She later informs him that she is pregnant. In an effort to cover his sin, David summons Uriah from the army in the hopes that Uriah will sleep with Bathsheba, thus making Bathsheba's pregnancy seem legitimate. However, Uriah declines David's offer to take his ease at home, preferring to remain with the palace troops. After repeated efforts to get Uriah to sleep with Bathsheba, David dispatches him back to the front with sealed orders for Joab. The faithful Uriah is to be abandoned during the heat of battle and left to the hands of the enemy. Joab performs this treacherous deed, and Uriah is killed as a result. After completing her period of mourning for her husband, Bathsheba becomes David's wife. The prophet Nathan then comes to David and tells him a parable of a rich man who took away the one little ewe lamb of his poor neighbor (2 Samuel 12:1-6). The king is outraged by this unrighteous act and declares that the man should be put to death. The prophet, applying the case analogously to David's action with Bathsheba and Uriah, famously declares: "You are that man!" The king at once confesses his sin and expresses sincere repentance. 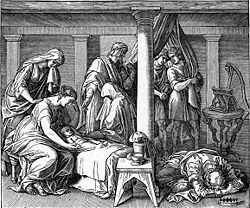 However, Bathsheba's child dies after only a few days of life, despite the king's desperate prayers and fasting. Bathsheba does not appear again in the narrative until David's old age, when she figures prominently in the question of who will succeed the king on the throne of Israel. David's elder son, Adonijah, makes a bid to usurp the kingship while David still lives. Nathan, now Bathsheba's ally, informs her of the plot and conspires with her to ensure that Solomon will become king. Bathsheba enters the king's presence, tells him of Adonijah's actions, and reminds him of a promise he apparently made that Solomon would reign after him. "My lord the king," she implores him, "the eyes of all Israel are on you, to learn from you who will sit on the throne of my lord the king after him. Otherwise, as soon as my lord the king is laid to rest with his fathers, I and my son Solomon will be treated as criminals" (1 Kings 1:20-21). Nathan confirms Bathsheba's report, and David determines to have Solomon anointed and enthroned that same day. The beneficiaries in this counter-coup, beside Solomon, Bathsheba, and Nathan, are the priest Zadok and the military captain Benaiah son of Jehoiada. On the wrong side of events are Adonijah, the priest Abiathar and David's long-time general Joab, the very man who had conspired with David in the murder of Bathsheba's first husband. After David's death, Solomon carries out his father's deathbed command and orders Benaiah to assassinate Joab. The handsome Adonijah, however, wins a temporary reprieve, "if he proves worthy." Bathsheba plays a role again at this point, as Adonijah requests that she ask Solomon to give him David's young concubine, Abishag, as his wife. Bathsheba approaches Solomon with the request, which he interprets as treasonous. He uses the occasion as a basis to justify the execution of Adonijah. In Talmudic tradition, Bathsheba may have been providentially destined from the time of creation to become in due course the legitimate wife of David, but this relation was prematurely precipitated by David's impetuous act of adultery with her. The influence of Satan in bringing about the sinful relation of David and Bathsheba is described as follows: Bathsheba was on the roof of her house behind a screen. Satan, disguised as a bird, flies out, and David shoots at him, striking the screen. Thus Bathsheba's naked beauty is revealed and David is unable to resist the lust that this engenders in him (Sanhedrin 107a). Other rabbis excuse David's act as mere fornication and not adultery, on the grounds that soldiers customarily left their wives with a bill of divorce, in order to enable them to remarry if their husbands went missing in action. Another opinion holds that Uriah was guilty of treason for refusing to obey David's order to sleep in his own house, and that his alleged murder was actually a lawful execution. 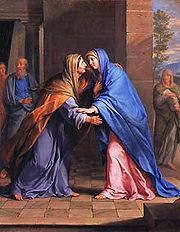 Mary greets Elizabeth at the house of the priest Zechariah. In the Gospel of Matthew (1:6) Bathsheba is listed as an ancestor of Jesus, although she is referred to not by her own name, but as Solomon's mother, who had been "Uriah's wife." This gospel goes out of its way to mention four particular Old Testament women in Jesus' lineage. The first is Tamar, who committed adultery with her father-in-law Judah in order to perpetuate his dying lineage. Another was Ruth, a Moabite who married her husband's kinsmen Boaz even though this was a violation of the strict interpretation of Jewish law (Ezra 9:1). The other was Rahab, the mother of Boaz. Some believe that this Rahab is the same person as the former prostitute of Jericho who helped Joshua's men in their spying mission (Josh. 2). Thus, three, and possibly all four, of the women named in Matthew's genealogy were women of alleged sexual impurity. These unusual liaisons in Jesus' ancestry are often seen as being a sign of God's grace. Others believe there may have been a special providence at work in Jesus' lineage, in which these women played a central role. The last of these providential women would be Mary, the mother Jesus, who conceived her holy son outside of the normal relationship with her husband, Joseph, who initially intended to divorce her for infidelity (Matt 1:18-19). David is considered a prophet in the Islamic tradition, and Islam does not ascribe sin to the prophets of Allah. Thus, in the Qur'an, there is no story of sin with Bathsheba, nor is there the episode of the return of Uriah and his sleeping in the king's house. The child that dies is not mentioned, nor is there any mention of Nathan or his part for Solomon's succession. While Christians and Jews may consider these omissions suspect, it is well to remember that if one were to read the story of David Chronicles alone, rather than 2 Samuel, the story of David's sin with Bathsheba would be very hard to discern. The passages in which Bathsheba's story is told are 2 Samuel 11:2-12:24, and 1 Kings 1-2, both of which are believed to be from the oldest stratum of the books of Samuel and Kings. On the other hand, the story of David's sin with Bathsheba is completely omitted from the account of Chronicles, which likewise omits Nathan's condemnation of David, the death of David and Bathsheba's first child, and other episodes embarrassing to both Daivd and Solomon. The father of Bathsheba was Eliam (spelled "Ammiel" in I Chronicles 3:5). As this was also the name of a son of Ahithophel, one of David's old counselors, it has been conjectured that Bathsheba was a granddaughter of Ahithophel. 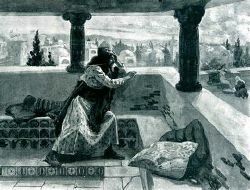 Some suggest that Ahitophel's desertion of David at the time of Absalom's rebellion was related to David's conduct toward Bathsheba. David's conduct toward one of his earlier wives, Abigail, may also be instructive in relation to Bathsheba. Abigail was the wife of Nabal the Calebite, who had offended David's men by refusing to offer them tribute (1 Sam. 25). David was about to take revenge on Nabal's entire clan when Abigail approached him with gifts and convinced him not to sin by bloodying his hands, assuring David that God would bless him richly in the future. David accepted Abigail's advice, and she soon became his wife when Nabal died at Yahweh's hand instead of David's. This story may suggest that an alternative course existed for David and Bathsheba by which Bathsheba could have become his wife without David's first committing adultery with her or murdering her husband.